One of China’s few natural “resources” that continues to grow is degraded lands. Nevertheless, some promising techniques exist in South China that have potential to improve the degraded lands, solve associated environmental problems, and improved the economic conditions of the farmers. Such techniques may help relieve the growing pressure that exists on their remaining productive lands. This author collected examples of similar techniques from South China and published them in Improving Degraded Lands: Promising Experiences from South China in 1993. These techniques provide hope that South China’s extensive tropical/sub-tropical degraded lands might once again become environmentally and economically productive. Below are three such promising research and development activities designed for degraded sites that need further demonstration, refinement, and ultimately extension to farmers . 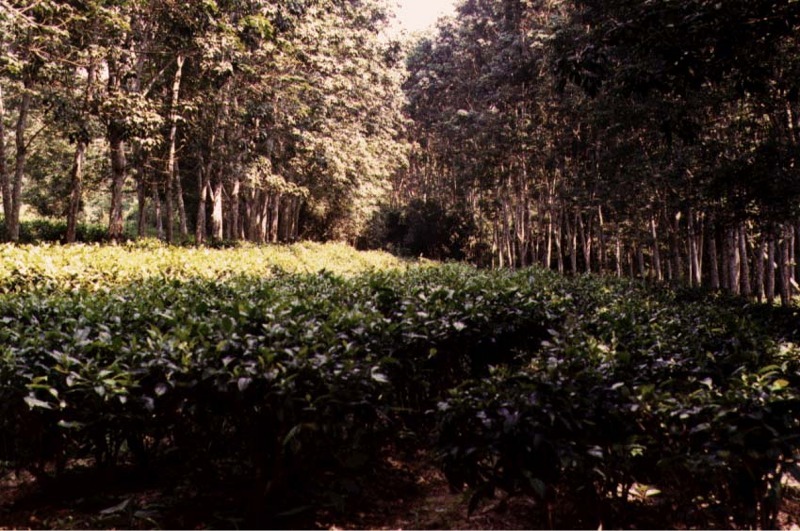 the income/unit area of the rubber/tea system is significantly higher than either monoculture. 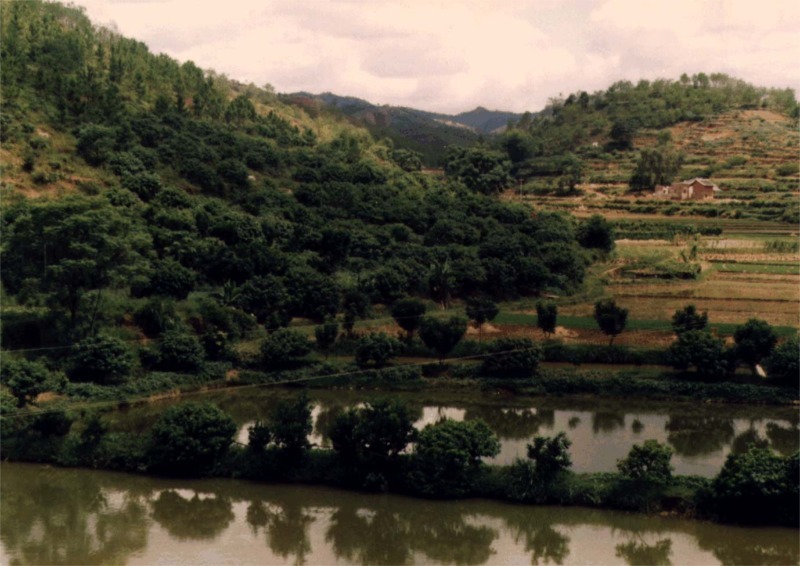 An important technique developed to improve degraded hilly-lands in South China is stereoagriculture, a form of Chinese ecological agriculture. Stereoagriculture generates a variety of products (e.g., food and fiber from plants and animals, firewood, and medicines) from topographically varied sites and conserves natural resources and improves damaged environments. Typically in stereoagriculture, conservation forests clad the hilltops to slow soil erosion and runoff and to increase ground-water recharge. The benefits from doing so accrue to sites at lower elevations. Hillside forests are a blend conservation and economic forestry. These forests satisfy local fuel and timber needs and needs for other forest products. Some animal grazing may occur here. Below on the flat land, lies an intercropped mixture of orchards and food crops, interspersed with fish ponds, and grazing of small animals. In this lower area, various intercropping systems provide the farm with his chosen foods. These systems take advantage of the different morphologies of the above-ground parts of various plants to develop appropriate beneficial sun and shade settings. In a similar way, the researchers determine the most beneficial spatial arrangements of the root systems of the intercropped plants to minimize competition for water and soil nutrients. As expanding industrialization and urbanization increases, the demand for flat land increases and many farmers are displaced onto hilly lands. Stereoagriculture, therefore, provides various long-lasting economic and environmental opportunities for the farmer. Stereoagriculture needs further, broad demonstrations in South China in its various forms to illustrate its benefits and to encourage its wider use by farmers. Zeolites are a group of naturally occurring, fine-grained minerals with pronounced ion exchange properties. Chinese researchers are testing zeolites from South China in various agricultural settings. The researchers find that adding small amounts of zeolite to highly weathered, low-fertility soils significantly slows the leaching of fertilizer (nitrogen and potassium) into the environment and aids in releasing tightly bound soil phosphorus to the plants. Corn grown on soils amended with small amounts of the zeolite clinoptilolite had as much as a 29.5 percent increase in biomass production and improved nitrogen-use efficiency. Chickens fed a zeolite supplement required reduced feed and, ammonia pollution from chicken wastes decreased. The volume of water needed to raise turtles, instead of having to be changed every two days only had to be changed once every ten days after addition of a small amount of zeolite. Fishpond water had its BOD, COD, and NH3 content significantly reduced , 29.3%, 50.9%, and 42.0% respectively, by the addition of small amounts of zeolite. In addition, turtle diseases decreased in zeolite-amended water while their survival rate increased. These test data suggest that natural zeolites may find some important uses in addressing degraded land problems and in offering new economic opportunities to farmers. Zeolites can help prevent agricultural pollutants from entering the groundwater and surface waters, help make clean-water resources last longer where fish and turtles are raised in ponds, reduce chicken feed requirements, and increase the survival rate for turtles while decreasing disease.